I will be the first to tell you that the photo I took of this recipe is, well, gosh darn unappetizing. But, it really does taste good! It's really a great go-to meal for ground beef, when you don't feel like just plain spaghetti, tacos or sloppy joes. The original recipe for this was in the February/March 2010 issue of Taste of Home. (The recipe won a contest, so unless you're a subscriber, you won't have access to the link.) They recommended making individual servings in ramekins, but, hey, I'm a busy mom and wanted to simplify things for myself. I just baked it all together in one casserole dish. Want to get more veggies in your kids? Then saute some with the beef. Carrots and zucchini would be yummy! In a large skillet, cook beef and onion over medium heat until meat is no longer pink; drain. Add the marinara sauce, salt and pepper; cook and stir for 8-10 minutes or until thickened. Spoon into four 8-oz. ramekins or one casserole dish; set aside. In a small bowl, combine the flour, baking powder, salt and Italian seasoning. Stir in the rice milk and margarine just until moistened. Spoon dough over meat mixture. If using ramekins, place them on a baking sheet. Bake at 450° for 12-15 minutes, if using ramekins, or until golden brown. Add a few extra minutes to the baking time, if using a casserole dish. 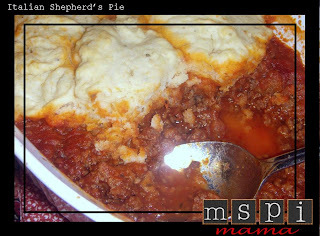 Tip: The topping is pretty thick and can be kind of difficult to spread over the meat mixture. I just dropped it on top, like dumplings. They'll puff up and cover the entire mixture during baking.